FIELD NOTES: Living in this digital age, there are many skills that are arguably becoming obsolete (I, for one, have lost the ability to do basic math without my trusty phone calculator). A couple more skills that are seemingly going the way of the dodo are penmanship, spelling and grammar. But not in the world of graffiti! Calligraphy is alive and well on our alley walls. 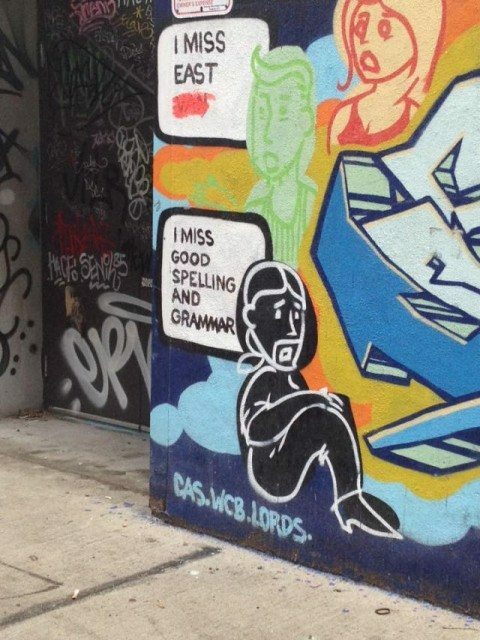 With this piece we see all is not lost when it comes to grammar and spelling, either. There is hope for the future, people! Even, or maybe especially, if that hope lies in illegal art.